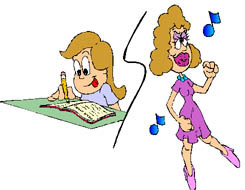 Monday Musings: Split personality of a writer…. I had hoped to have an extra-special post today. As many of you know I’m preparing for the release of my first contemporary romance, SATIN PLEASURES, by the end of this month. Alas, I must wait to share my new book cover and book blurb with you. The cover isn’t finished. Sigh. With any luck, I’ll have it for you next Monday along with the announcement the book’s available for sale. It drives me crazy when I don’t have control over absolutely everything! There, I said it. I’m a control freak. A nice appellation is “Type-A Personality” but we all know that simply means that I worry things into perfection. I write and revise and write and revise my manuscript pages daily. This blog post will be revised half a dozen times as I write it. Blast through an entire story and then go back and edit? Pshaw! Each scene I write is completely revised at least ten times before I type THE END on a manuscript. I can’t go on until I’ve gone back over the previous 2-3 scenes. In theory, I know this methodology was born as a result of the years I spent in revision as a pure pantser. Yeah, I know it’s hard to believe I was ever a pantser but, believe me, it’s true! I used to get up each morning and write whatever came to mind. I didn’t plot anything and went wherever my muse took me. I wallowed in the creativity I didn’t allow anywhere else in my life. Completely unfettered, I wrote one of my earlier novels in eight weeks! I don’t know where that writer went. I can’t even pinpoint exactly when she disappeared into the mist. It was a gradual thing and can be attributed to a number of factors. Spending months, years in perpetual revision was only part of the transition. I learned a lot about the craft of writing during that time. POV (Point of View). Characterization. Plotting, etc. Each skill I added to my repertoire made it more difficult for me to separate my creative side from my pragmatic side. When I made the subconscious decision to turn my love for writing into a career—yes, it was subconscious long before it became a conscious decision–my business background took hold, my stories became creative products, and the rest, they say, is history. I’ve since forged a comfortable balance between my creativity and my skills. Well, most of the time, it’s a comfortable balance. The editor perched on my shoulder does have 12-inch talons embedded in my creative soul! I plot using the “W” technique I teach. I focus my attention on making sure I use my technical skills to create a coherent, compelling story. And my muse has learned to dance in whatever scene she wants in whatever order she wants. (Yes, I’m a non-sequential writer 🙂 ) Thanks to this alliance, I’m now ready to present my book to the world. 12 Responses to Monday Musings: Split personality of a writer…. Ha! You could always learn to use photoshop, lol. Ha! Thought of that. Spent weeks trying to find inspiration with photos and finally realized the tone of my contemporary romances is lighthearted and cutesy. Only drawing captures what I wanted. Hence, the decision to find a real artist. My suspense novels are going to be whole ‘nother story though! Karen! I think maybe all writers have control issues. I know I can’t blow through the scene or book and then go back and edit. First thing each morning, I’m reading yesterdays words and revising! Then after the book’s finished…I go back and edit! Take care..you are not alone! It’s good to know I’m not alone. Sounds like we both write a lot alike. I find going back and reading/revising not only shortens my revision time, but gets me back into the flow of the novel. I enjoyed your post and I love the title of your new book. Best wishes with the launch. I love the title too, Jo-Ann. It’s the name of the hero’s lingerie shop…among other things. 🙂 Thanks for your best wishes! Have a great week. Looking forward to seeing your cover! I knew we were a lot alike! 🙂 We do work the same way. I can probably recite certain scenes word for word, especially chapters previous to any I struggle with, since it’s one of the methods I use to launch into a new chapter. If I’m having a hard time capturing the new chapter, previous one gets read to death. I would love to breeze through my preliminary rough drafts like I used to when I started but I think that ship has sailed! Sounds like I am in good company! Control / worry issues have always been my plight! I self-pubbed a book before it was cool, wasn’t entirely satisfied wtih it and am now having an editor work on it to make it PERFECT (right!) Good luck with your book! Best of luck with your editor and your book, too!